This was my last day at work. I quit my job to stay home with Reagan full time, she has physical and occupational therapy 4 times a week, so running her around is a task in itself! It's the single best thing I think I could have done for Reagan. She seems so much happier now. 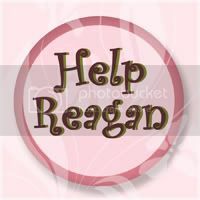 Someday I'll find another job, something where I'll be able to help children that suffer from childhood epilepsy or other disorders, but for now Reagan is my top priority! Reagan's pediatric neurologist ordered a lumbar puncture to check for treatable neurotransmitter diseases (including the one associated with folic acid deficiency). It was a traumatic ordeal for everyone because they decided not to use general anesthetic and we had to hold her down while they performed the procedure! I would highly recommend sedation. The results all came back negative. 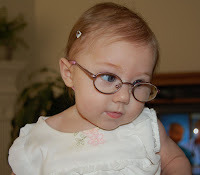 We took Reagan into a neuro-ophthalmologist and she said that Reagan's eyes were healthy, but that she had delayed visual maturation and was extremely farsighted like an infant, although she said that it should improve over time and with seizure control. She gave Reagan some glasses (which she wears infrequently because they don't really seem to help) to try to "jump start" her vision. We later found out that in her records this doctor also diagnosed her with something called CVI (cortical visual impairment), similar to delayed visual maturation, but it basically means that something is being lost in the translation of information between her eyes and brain. She currently receives vision therapy once a week. On Sept 10th Reagan had her 2nd cluster; she had another EEG the following day and the results were the same as before- abnormal with hypsarrythmia. On Sept 16th she had her 3rd cluster and was started on a low dose of Zonegran a few days later. While on the Zonegran, she also went through a trial of vitamin B6, which didn't seem to help. Reagan had a lumbar puncture on October 15th to check for neurotransmitter diseases (all came back negative) and had her 4th cluster the following day. She had another EEG on October 15th, which still showed hypsarrythmia during sleep, but it did show a more normalized pattern while she was awake. At this time Reagan was having anywhere from 10-30 individual startles/spasms a day but they were usually in response to a stimulus (like a loud noise, a burp, or if you got in her face and scared her), we never really thought of them as seizures, but according to her epileptologist, they were. So we started increasing her Zonegran to see if it would get rid of the individual seizures, and although we didn't see any more clusters, it didn't change the amount of individual startles she was having. In the video the individual spasm is very subtle and occurs about 21sec into the clip. We met with the director of the epilepsy clinic and after listening to us and reviewing all of Reagan's information he said that she did not have infantile spasms/west syndrome. We didn't really understand his reasoning but we were overjoyed nonetheless! He took her off the zonegran, but mentioned that seizures are very common in children and that once you have a seizure it makes you more likely to have another. Everything came back normal except she showed a slight delay in myelination in her MRI but her EEG came back very abnormal with traces of hypsarrhythmia. The neurologists at the hospital told us hysparrhythmia=infantile spasms and after reading up on it, we were shattered. They wanted to start her on ACTH right then, but instead they started her on Zonegran until we could meet with the epileptologist the following week. We were sent home completely devastated! When I went to pickup Reagan from daycare she was crying which wasn't out of the ordinary, but I noticed her doing this weird "jumping". I immediately felt sick to my stomach and I knew something was wrong. It was almost as if she was startled, her arms would extend forward and her head and neck would go back. She would do one every 5-20 seconds. I asked the people watching her how long she had been doing it and I think it had been going on for over an hour (it's hard to tell because I think she started out doing it every 15 minutes or so and then they progressively got closer and closer together). I took her home and she continued doing it and then finally fell fast asleep. I spoke with her pediatrician at the time who mentioned that it might be a seizure, but didn't seem to be in any hurry to see her. 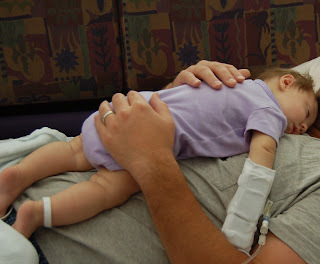 We watched her closely overnight and then took her to a new pediatrician the next day. The new pediatrician was very concerned with Reagan's developmental delay, her head circumference was measuring small (microcephaly), and she suspected seizures...she wanted admit Reagan to the hospital to run multiple tests on her. At about 2-3 months old we noticed Reagan's eyes crossing (usually just her right eye) and we were concerned that it might be affecting her vision. We spoke with her pediatrician and she told us not to worry and that her eyes should straighten out by 4 months. They didn't. Still concerned because she wasn't making eye contact or grabbing at toys like she should have been, we scheduled an appointment with a pediatric ophthalmologist who looked her over and said that her eyes were healthy and that her vision was fine and that her eyes should straighten out by 6 months. After 12 weeks at home, it was either get back to work or I would lose my job, so I went back to work and Reagan went to daycare during the day. I wasn't thrilled about leaving her at daycare, although the daycare she attended seemed to give more attention to babies than other daycares we looked into. 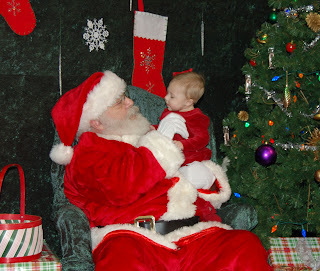 At this time Reagan was still quite fussy (as noted on her daily progress reports) and cried a lot. Reagan slept well for the first week, but ever since it's been a constant struggle. She's never slept in her crib. We've tried just about everything, sleeping with her on our chests, beside us in our bed, and then in a swing (which is where she sleeps now). 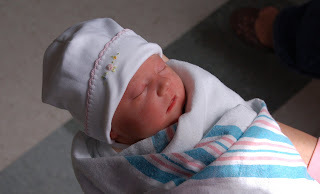 She had tons of gas and was a very fussy baby crying often, we thought colic was going to be our biggest challenge. She also has never been a good eater. She would fight me and cry for the first 4 months of breastfeeding and while she prefered drinking from a bottle, it would take her forever to drink a respectable amount of milk. She was always very sensitive to loud noises and would startle and cry very easily (we just figured it was because she was an only child and lived such a sheltered life). After an uneventful pregnancy and an easy labor and delivery for a first child, Reagan Leigh was born at 12:14pm. She weighed 7lbs 10ounces and was 19 inches long. Her eyes were a little bloodshot and she had some fluid in her lungs from coming out so fast, but they suctioned it out and she was fine! She was our perfect little angel! 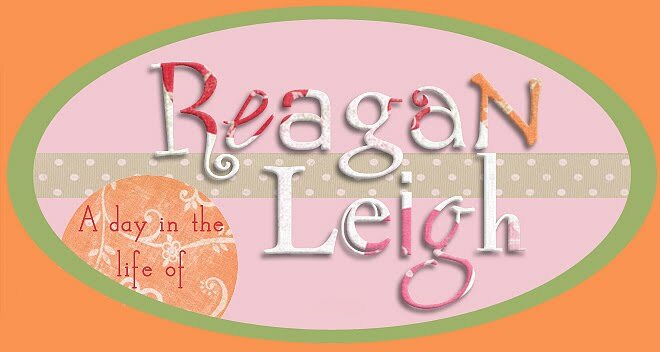 Reagan Leigh was born on March 21, 2007. She was full term and the picture of health. The first few months of her life were relatively normal. We were adjusting to the lack of sleep and slowly learning how to console a colicky baby. When Reagan was four months old we took her to see an ophthalmologist because she wasn’t making eye contact and her eyes would turn in. The doctor told us this was normal and she would probably grow out of it…her eyes were “healthy”. At this point we had noticed some delays in her development, but being first time parents, the signs weren’t that obvious to us. We just assumed that the delays were related to her eyes turning in. However, she was later diagnosed with a neurological condition called Cortical Visual Impairment. She has very limited vision and has already had cataract surgery on both eyes. When Reagan was five months old I witnessed an occurrence of twitches that concerned me and we took her in to a new pediatrician for evaluation. Immediately the doctor ordered testing and suspected seizures. 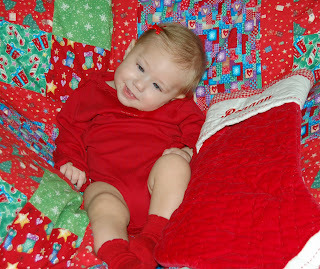 Following testing, Reagan was diagnosed with a catastrophic seizure disorder called Infantile Spasms. It’s amazing how your whole life can change in the blink of an eye. These seemingly insignificant “twitches” were in fact very harmful to her development and continuously increasing. Reagan had hundreds of these seizures a day which caused her development to remain at a virtual standstill since her diagnosis. At one point, she was having, in excess of 1000 seizures a day. She has been on a myriad of drugs, both oral and injections. Our lives quickly became filled with doctor’s appointments, therapy sessions of all kinds, and endless barrages of testing. She is now on her fourteenth medication (Banzel) and it's the only one that has ever significantly decreased her seizures. After tons of genetic and metabolic testing that all came back normal, we finally decided to have a muscle biopsy to check for mitochondrial disorder and it came back positive for a defect in the Mitochondrial Complex I & IV. Our faith, family, and friends (many of which we've met online with similar stories to ours) have helped us through this trying time. We still hold out hope that Reagan's development will take off and we'll see great progress. We believe that through God all things are possible!